Dental pain is the worst. You just want to enjoy an ice cream, or sip a hot cup of coffee, but that darn pain! Tooth and gum pain can have a myriad of causes, and can sometimes require some serious dental care to recover. Having said that, the symptoms of mild dental pain might be reduced by some home remedies. If you’re going to try these for yourself, just remember that number five will always be the most effective. My grandma would always recommend this one. If your teeth are feeling sensitive, try mixing about half a teaspoon of table salt with a cup of warm water. Swish this salty water around your mouth for a minute or so, getting the salt to the most painful areas. It also works for sensitive gums. Either way, do this two or three times a day. I was subjected to this remedy throughout my childhood, and as a kid was convinced it worked like a charm. However, does it really work, or is this remedy just an old wives’ tale? Turns out, this traditional method of easing tooth sensitivity actually has some scientific basis, and is endorsed by no less than Colgate. On Colgate’s website, they explain that salt water can temporarily raise the pH level of your mouth, which kills off bacteria. Contrary to popular belief, Colgate also noted that salt water won’t irritate the mouth’s mucous membrane, making it particularly good for anyone recovering from dental surgery. The company also suggested that salt water can be used as an improvised toothpaste, soothe mouth sores and even help with minor colds. So what are you waiting for? Get some salty water and start swishing! Along with adding some complexity to your panang curry, cloves can also help ease dental pain. Grind a maximum of two cloves and mix with oil. Olive oil is often preferred, but in reality even cheap vegetable oil will do the trick. Use a cotton ball or swab to gently smear the oily concoction over any affected teeth or gums. Leave it on for around half an hour before rinsing. With any luck, you’ll be left with a fresh, painless mouth — albeit one that’s probably going to be tasting nothing but cloves for the rest of the week. Like the salt water treatment, this old home remedy actually has some scientific basis. Numerous studies have confirmed that cloves not only have an analgesic effect, but can also help dental pain specifically. In fact, Sarasota Dentistry advises its patents to consider using this natural remedy as an alternative to more expensive pharmaceutical options. Still got sore teeth? Maybe the best solution is the simplest one: brush, brush and brush. Most dentistry professionals agree the single biggest cause of tooth sensitivity boils down to not brushing properly. This might sound daft, but seriously: read the American Dental Association’s teeth brushing guide. It’s boring, but detailed and useful for anyone sick of tooth pain. Ensure you’re brushing your teeth twice a day, using a soft bristled brush. That last part is important, as according to the ADA many people brush way too hard. If you don’t like having garlicy breath, then you might want to skip this one. 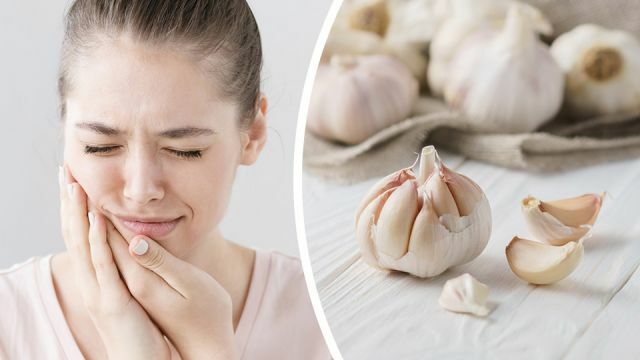 Garlic has been used to treat mouth pain for centuries, and is even endorsed by some dentists. The idea is that garlic contains allicin, which is proven to have antimicrobial properties. In other words, mouth bacteria love garlic breath about as much as your friends do. To try for yourself, crush one clove of garlic, then mix with a bit of salt and water. Apply this mixture once or twice a day to the affected area, but use sparingly. Despite the claims of some advocates of this method, garlic is far from harmless when used in excess. Check out this unpleasant 2008 case study of a man who suffered serious burns after using garlic to treat a toothache. Still got sore teeth or gums? In the end, there are numerous reasons why you might experience dental pain. You might have worn down enamel, or you could be grinding your teeth. The pain may even be symptomatic of a more serious dental problem. Whatever the cause, stubborn dental pain is something best left to the single most effective natural remedy out there: your dentist. Got any other good dental pain remedies? Let us know in the comments below! Hey Buddy!, I found this information for you: "My Grandma’s Solution For Sensitive Teeth + 4 More Natural Remedies". Here is the website link: https://www.thealternativedaily.com/5-natural-remedies-for-sensitive-teeth. Thank you.